Dawes' Passwords comes out June 22. 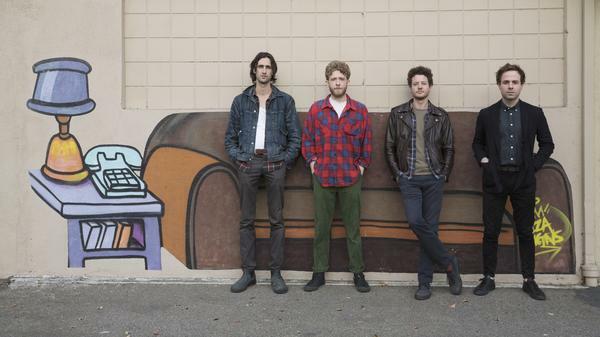 On the surface, Dawes' songs are bright, approachable, outward-facing throwbacks to the best in classic countrified rock, from Buffalo Springfield to The Band. Its songs often register as comfort food; as the stuff of festival stages in the summertime or barroom blowouts that can barely be contained by closing time. But singer Taylor Goldsmith also uses Dawes as a canvas for serious, sometimes enormously ambitious ruminations on the meaning of life and the myriad ways human beings find love, hope and meaning. Goldsmith clearly loves to cast around for unifying principles, from the one that gave Dawes' last album its title (We're All Gonna Die) to the one at the core of 2011's "A Little Bit of Everything," in which the singer revels in the sheer breadth of available experiences. On Dawes' sixth album, Passwords, Goldsmith goes big again: In the grandiose "Crack the Case," he identifies empathy and communication as the best pathways to addressing the world's ills, while the closing track's title doubles as a thoroughly Dawesian mission statement: "Time Flies Either Way." Even the name Passwords reflects an idea about the way songs can unlock secrets we keep from ourselves, granting us revelations into our own lives. "Time Flies Either Way" also points to some of the sonic shifts evident on Passwords, as Dawes balances its rowdier material with brushes of piano and soft saxophones. That song wouldn't have sounded that out of place on an early-vintage Bruce Hornsby record, while "Feed the Fire" grooves and snaps with busy bits of poppy soul that'd make Daryl Hall proud. Still, throughout Passwords and the band's career writ large, Dawes always returns to its greatest specialty: smooth and ingratiating California folk-rock that never bothers to hide its big, beating, bleeding heart.